Whether it’s winter or summer, don’t underestimate the damage strong winds can do to your roof. Wind speeds of just 50 mph can be enough to destroy portions of your roof and knock trees and limbs down onto it, which brings its own set of issues. Strong winds usually take aim at the edges of your roof. Shingles are susceptible to lifting or being blown off the roof completely, which means the roof underlayment will be exposed. At that point, it can easily be penetrated by water, as well as random windblown debris. The result will be a leaking roof, which can affect both the interior and exterior of your property. Shingles may look like they’re fine to the untrained eye, but a few wind gusts that are strong enough can lift them up, thus breaking the seal that keeps them attached. Once that happens, your roof may start to leak.Loose household debris tossed around by the wind – tree branches, lawn furniture, toys and even trash – can also be quite damaging if they land on your roof. If you see any gaps/holes in place of shingles, those need to be re-covered right away. If you see that shingles have lifted, they won’t be able to stop your roof from leaking. If gutters are filled with excessive amounts of shingle granules, this could be evidence of hail damage to the roof. Other signs of hail damage include dark spots on shingles, bruising, cracking and dented metal. If your roof is leaking, check your attic right away. If water is dripping from the ceiling, call us immediately. After a storm, reach out to Tony's Roofcare Inc. to inspect your roof for damage and lay out a course of action. You can count on our experienced roofers to provide you with the repairs or roof replacement you need, quickly and efficiently. 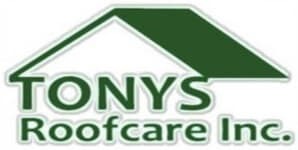 Reach out to Tony's Roofcare Inc. for immediate help with wind and storm damage to your roof or siding. Call us now at (253) 841-7779 or submit our online contact request form.